Lisa Carlsen of Okotoks, AB, Kara Chad of Calgary, AB, Eric Lamaze of Wellington, FL, and Ian Millar of Perth, ON, formed the Canadian Show Jumping Team that finished second in the $460,000 BMO Nations Cup held Saturday, September 8, at the CSIO5* Spruce Meadows ‘Masters’ tournament in Calgary, AB. A total of nine teams battled it out in the International Ring with Germany coming out on top with a final score of six faults. Canada held its own on home soil, fighting back in the second round to finish as the runner-up with a total of 13 faults. Ireland finished third with 15 faults, the United States was fourth with 20 faults, and Mexico placed fifth with 31 faults. France finished sixth after failing to complete the second round. Based on their first round scores, Belgium, Switzerland, and Brazil failed to be among the top six teams that moved forward to round two. Carlsen, 53, was the lead-off rider for Team Canada, delivering an opening score of eight faults riding Parette, her 12-year-old bay Brandenburg mare (Passoa VDL x Barinello). In the second round, they rallied and left all the rails in place only picking up one time fault for exceeding the tight time allowed of 74 seconds set by two-time Olympic course designer Leopoldo Palacios of Venezuela. Hometown favourite Chad had celebrated a win on Thursday and returned to the International Ring full of confidence for the BMO Nations’ Cup. Riding Carona, an 11-year-old grey Dutch Warmblood mare (Untouchable x Silverstone) owned by Lamaze’s Torrey Pines Stable, Chad had a rail in the first round at fence 10 before returning to post an all-important clear for Canada in the second round. Millar, 71, and Dixson, a 14-year-old bay Belgian Warmblood gelding (Vigo d’Arsouilles x Olisco) owned by Ariel Grange, incurred an uncharacteristic score of eight faults in both rounds with the challenging triple combination proving to be a trouble spot for the pair. Canadian hopes were riding on anchor rider Lamaze, 50, and Coco Bongo, a 13-year-old Rheinlander gelding (Caretino x Calido) owned by Artisan Farms and Torrey Pines Stable. 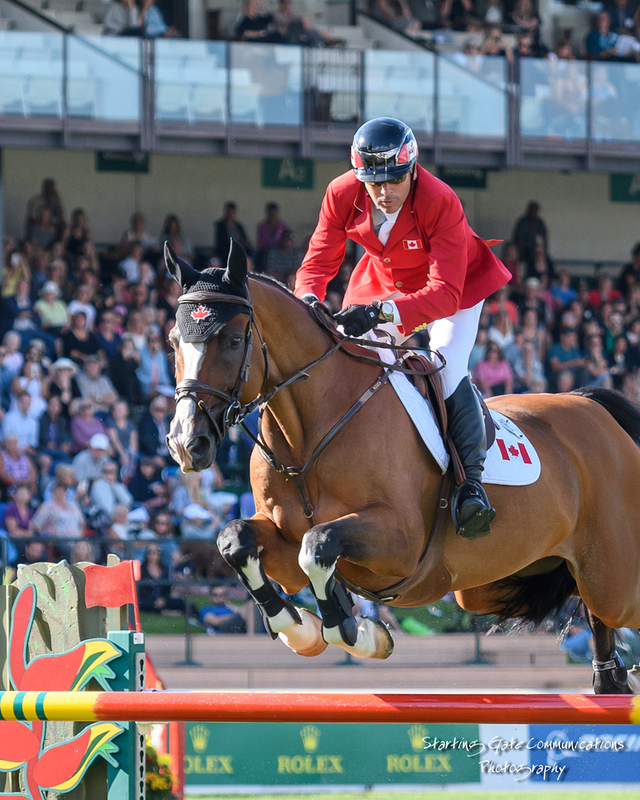 For the fourth consecutive time in Nations’ Cup competition, the pair jumped double clear, cheered on by more than 62,000 spectators who flocked to Spruce Meadows to support their favourite teams. Lamaze’s second clear round allowed Canada to drop the eight faults incurred by Millar and only count Carlsen’s single time fault. With 12 faults in the first round and one in the second, Canada finished on a two-round total of 13 faults to pull ahead of the Irish and claim $95,000 in prize money. Lamaze and Chad will be joined by Erynn Ballard of Tottenham, ON, and Mario Deslauriers of New York, NY, in representing Canada from September 19 to 23 at the WEG, held every four years and serving as the world championships of show jumping. Carlsen will be the travelling alternate with Parette. “I’m really happy with the results,” said Canadian Show Jumping Team chef d’equipe Mark Laskin of his team’s performance in the BMO Nations’ Cup. “Anytime you are on the podium at Spruce Meadows, you have to consider the day a success. It is such a prestigious event, especially for us as Canadians. I felt if we could get into the second round we could make a push, as our riders are very experienced, smart, and capable of making adjustments, which they did. It was great sport and the Germans were fantastic; they were practically uncatchable. Competition concludes at the CSIO5* Spruce Meadows ‘Masters’ tournament on Sunday with the $3 million CP International, presented by Rolex. For more information, visit www.sprucemeadows.com.